ACNOW "No Weapons of Firearms ....."
Act 35 explicitly states "A person that does not prohibit an individual from carrying a concealed weapon on property that the person owns or occupies is immune from any liability arising from its decision." So, what are the consequences of posting a business or a government building against the carrying of firearms and/or other weapons? If a person not does prohibit, i.e., does not post a "No Weapons" sign, then that person "is immune from any liability arising from its decision." Conversely, if a person does prohibit, i.e. properly displays a "No Weapons" sign, then that person is NOT immune from any liability arising from its decision. In other words, businesses and government entities are setting themselves up for a lawsuit should some be injured or killed if an incident occurs with a weapon when the signs say that no weapons are allowed. 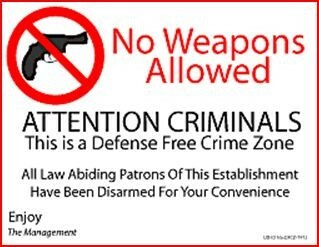 The "No Weapons" sign calls attention to the fact that law-abiding citizens will not be able to stop a crime or protect themselves. The criminal sees these potential victims as "soft targets". The "No Weapons" sign denotes a false sense of security. The building or the premises is not any safer because of the sign. In fact, the building or premises becomes less safe because the criminal sees a safer opportunity to commit the crime. The "No Weapons" sign also makes the area around the building and the routes to and from the building just as dangerous as the posted building itself. Criminal can target the consumer in the parking lot, and beyond, of a posted building. The "No Weapons" sign is a blatant refusal of allowing a law-abiding person to exercise their constitutional and inalienable right to self defense. It is simply "un-American". Logically, the "No Weapons" sign tells the law-abiding citizen to either stay away or "enter at your own risk". Your rights are not respected and your safety is compromised. Would you knowingly enter a dark room that has a sign on its door warning "Caution darkened room may contain free-roaming poisonous snakes"? Your hard earned dollars would be better spent elsewhere. The law firm or lawyer that advises a business or government to post is guaranteed of income when the suit goes to court. So why wouldn't they advise to post! They're simply living up to their "uncouth" reputation. The smart business will not post signs prohibiting the carrying of weapons for self defense. The smart consumer will not frequent places that post such signs. Governments, by nature, are not usually smart, so we would expect them to post the "No Weapons" signs. However, we can always hope that governments will eventually learn that their main purpose is to protect the constitutional rights of the citizens. 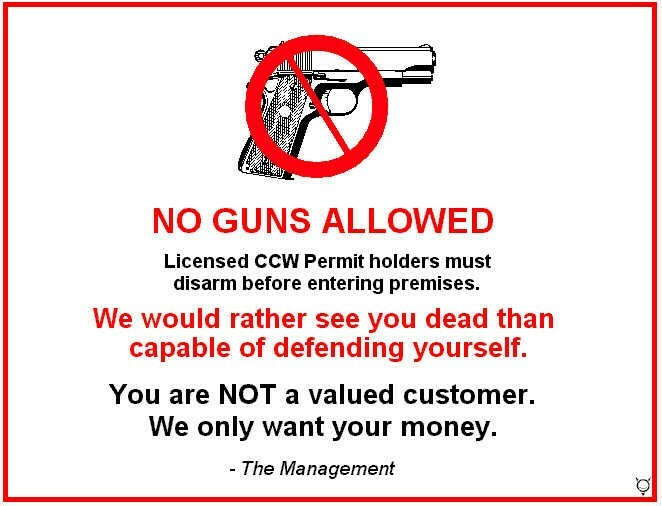 The smart consumer will stay out of places that display any "No Weapons or No Firearms" signs.